Probably everyone has a river in his life. I suppose it needn’t be a river; for some it is a mountain. For others it is the ocean, that great river that circles the known world. But it is an image of the larger picture of life: the flowing from one point to another; the sense that nature was here before us and will be here after we’re gone. For Mark Twain, it was the Mississippi, for Henry Thoreau it was the Concord. You have yours: the Colorado through the Grand Canyon or the Columbia past the wheat fields of eastern Washington. 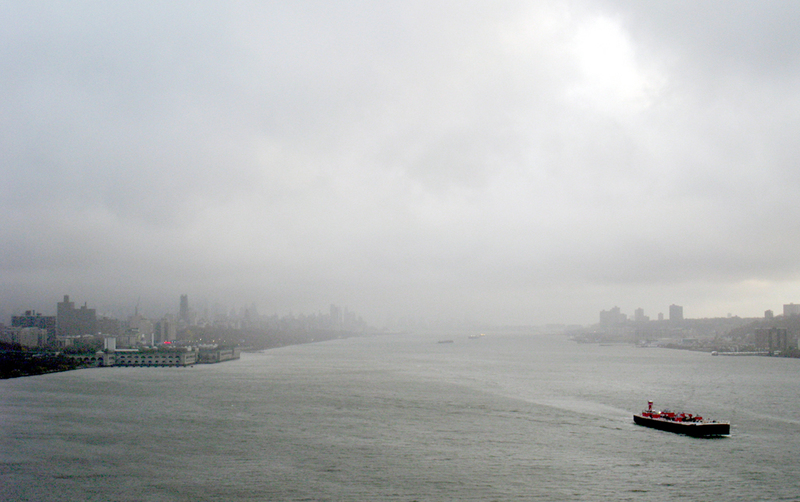 For me, it is the Hudson. From Battery Park north to Albany and beyond, the 315-mile-long Hudson is broad, gray and dignified, three miles wide at its broadest point, the Tappan Zee. It was for me, as I was growing up, the single very definition of what a river should be. When I later lived in North Carolina and would cross the Deep River or the Yadkin, I had to laugh. They were little more than creeks. Adding to the river’s stateliness is its history. The Hudson passes underneath the steep basalt cliffs of the Palisades, where George Washington beat a hasty retreat from the British troops when leaving Manhattan in 1776. It runs past the tiny town of Tappan where the spy John Andre was hanged. The river circles Bear Mountain just south of West Point, where Benedict Arnold tried to sell out the rebel nation. All of these places are still there for the traveler to see. And so are the earlier historic spots, leftover from the Dutch colonization of the area. There are old stone houses with Mansard roofs along the river and places with names made famous by Washington Irving in his stories, The Legend of Sleepy Hollow and Rip Van Winkle. That Dutch presence is still felt in many place names: High Tor, the Spuyten Duyvil, Yonkers, Sparkill. What isn’t still there are many of the landmarks I knew as a boy. The “Mothball Fleet” of hundreds of World War II liberty ships are no longer lined up north of Haverstraw in a crook in the river. The white-knuckle stretch of U.S. 9W around Storm King has been straightened and tamed. The Yonkers ferry long ago ceased running from the base of the Palisades to what was then a quiet, middle-class suburb of New York City. But that is part of the mythology of the river: You can’t step into the same moment of history twice, either. It is all one great flowing. At least 9W is still there, and it still the best way to see the river and its countryside. From the George Washington Bridge, it travels up the West Shore of the river until it rejoins its eastern branch, U.S. 9, at Albany. Along the way, you pass Harriman State Park, with its scenic Seven Lakes Drive; you pass Bear Mountain, with its winter ski jumping; you pass West Point, Newburgh, Kingston. You pass tiny West Park, where the famous 19th Century nature writer John Burroughs had his rustic cabin in the woods. The river flows down from the north through the mountains, which rise on both sides. The Catskills on the west, the Taconics on the east. It is through them that I left the Hudson Valley many years ago on the Twentieth Century Limited which rode the tracks on the east of the river past Sing Sing Prison and Peekskill on the way to Chicago, where I caught the Empire Builder to Seattle. I felt a little removed, seeing the familiar landscape on the Western Shore from the unfamiliar perspective of the opposite river bank. But I couldn’t help respond to the gentle green curves of the mountains and the hundreds of ducks that shivered the water that November morning as the train spooked them. In some way, the Hudson River is who I am. That’s what rivers are for. The best way to enter any great city is across a great bridge, and there is neither city nor bridge greater than the George Washington Bridge and Manhattan. And the best way to cross the bridge is neither by bus nor car, but by foot. Park by a meter on Kelby Street in Fort Lee, N.J. — you don’t really want to drive in New York City anyway — and begin walking toward the noise. You can’t miss it. On the way, notice the broad expanse of green where the Port Authority, which operates the bridge, decided to beautify the cement by painting it the color of grass. 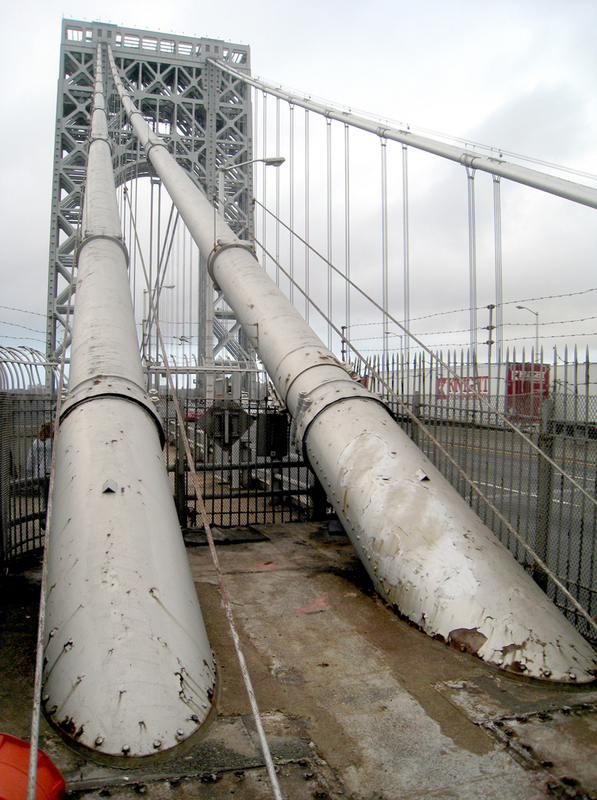 The GWB is a monument to pre-war design and engineering. With its lower deck, added in 1962, it handles a total of 14 lanes of traffic, all spewing fumes and rumbling geologically: The noise shakes the ground underneath your feet. The bridge approach cuts through a rise of raw basalt, leaping out past the cliff-face of the Palisades and flying high over the Hudson River, 200 feet below. You walk under the graffiti-sprayed rock of the approach, and pass Brobdingagian air vents that clear exhaust from the lower road level tunneling under you. And then you see the cable anchors, with the main steel cables like twin pipes, each three feet in diameter, angling up from the ground toward the top of the first of the Erector Set towers. Looking almost as delicate as spider web from the distance, twined iron cables descend from these main tubes and support the weight of the roadway. If you touch these vertical cables, you can feel them vibrate and hum sympathetically with the noise of trucks and buses. As you step out onto the bridge proper, the view opens up. If you are lucky and the air is clear — a rare but glorious occurrence — you can see all the way from 178th Street, where the bridge connects with the island, down to the lower harbor to the south and Rockland County in the north. Most of Manhattan spreads before you, from the Spuyten Duyvil to about 30th Street, where the river bends around the south part of the island. Boat traffic moves below you in poetic slow motion. More often, the city disappears in a whitish haze by about 145th Street. The smog can be choking, to say nothing of the diesel fumes from the Red and Tan buses passing a few feet from you on the roadway. There is wind, there is traffic roar and their is the smell of exhaust. It is all exhilarating. The bridge was opened in 1931 and its criss-cross of iron girders has been painted so many times the silver-gray has built up like cake frosting over the rivets and joints. Each upper surface is further highlighted in a dusting of grimy soot. The concrete sidewalk makes a detour around the outer edge of the tower, which rises to the height of a 60-story building. From there, you can look back and see the apartment buildings at the top of the cliff where Palisades Amusement Park and its roller coaster used to be. At the bottom of the cliff, Henry Hudson Drive meanders through Palisades Interstate Park. You can see families on outings alongside the drive below you, looking like ants at their own picnic. The first half of the mile-long walk across the bridge is slightly uphill. At the peak, where the giant cables loop down close to the roadway, there is a sign marking the boundary between the two states. And from there, it is all downhill into the city. But as you approach the second steel-lattice tower, you should look down over the handrail. 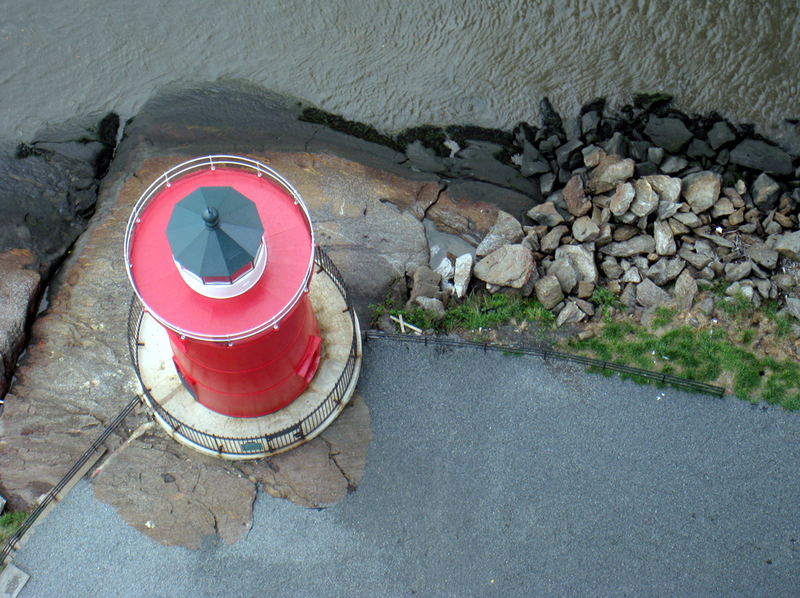 On the rocks at the base of the tower is the little red lighthouse of the children’s book. It is still there, but looking rusty and scribbled on with spray paint. You’ll pass a few hardy joggers and a bicycle or two, but for most of the walk, you’ll have the bridge to yourself. 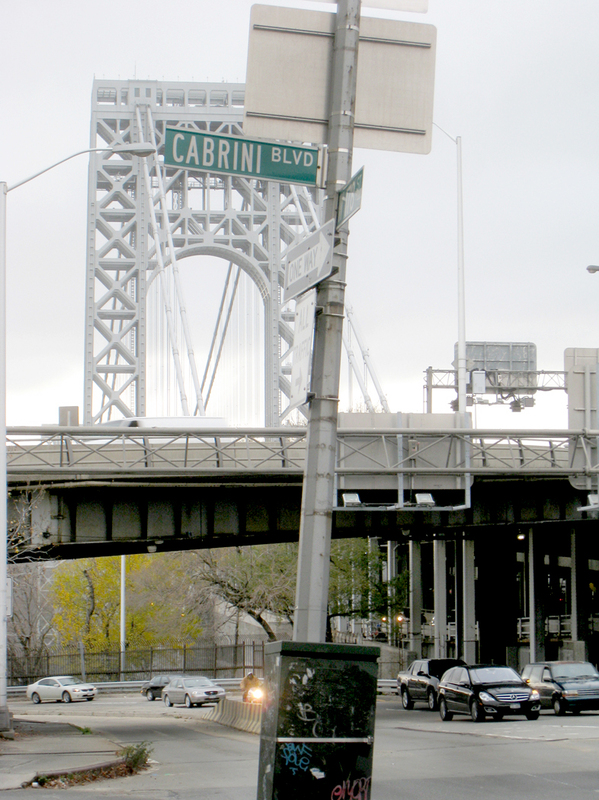 Once in Manhattan, you take a descending spiral walkway down to Cabrini Boulevard and walk up 178th Street toward the bus terminal, which was designed by Pier Luigi Nervi and opened in 1962. From their, you catch the A-Train. I take this walk each time I visit New York. I do this in part because it is such an invigorating hike, but it is also a pilgrimage. My grandfather worked as an engineer during the construction of the bridge, from 1927 until his death of tuberculosis in 1930; my mother was six years old. So although I never knew him, I feel through him a kind of inheritance, an ownership of the regal old bridge. And like some English lord whose castle is now part of the public trust, I like sharing the experience of my bridge with others. Wonderful blog post, Richard. Took me on a trip the way your writing always does. Nice.